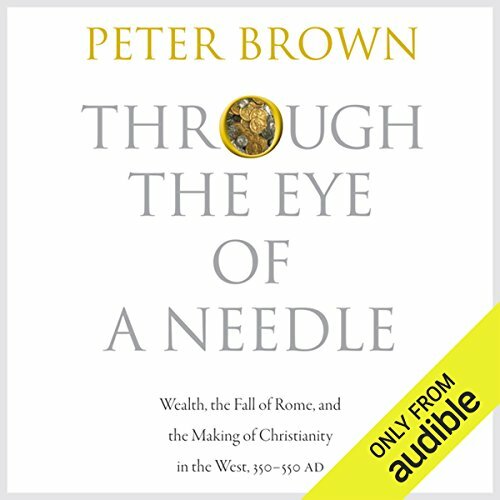 I was pleasantly surprised to come across this Audible Inc. production of Prof. Peter Brown's newest book "Through the Eye of a Needle: Wealth, the Fall of Rome, and the Making of Christianity in the West, 350-550 AD. Brown, the author of the best biography of Augustine of Hippo, is a careful meticulous and and well-respected historian of the late Roman Empire. He writes with authority. In "Through the Eye of the Needle" Brown uses different sources (artefacts, catacombs, archaeological insights, written texts etc.) to reconstruct what has traditionally been seen as the time of the Roman Empire's decline. Already in the awkward dates that he uses in the sub-title of his book 350-550 AD and not for instance 324 (when Constantine was became emperor over the whole Roman Empire), Brown distances himself from traditional top-down historiography that focus important persons and places. While using important figures, like Maxentius, Augustine and others, he aims to document and interpret the way the not-so-important people of the late Western Roman Empire understood wealth. He uses wealth at the key to sketch a different but more believable picture of late Roman Empire and its different churches' rise to prominence in its society. I found his take on the Pelagian controversy very interesting and enlightening. Fleet Cooper did a fair job in reading the book. I am not sure if it is Brown's writing style or Cooper's way of reading, but it felt that some sentences were often to long and Cooper would break for breath making it difficult to comprehend a whole idea as a thought unit. That said, Cooper's pronunciation of foreign languages and the general ease of his reading made it pleasant to listen to. Not everybody would like this book. At times it is very technical and might even be too thorough to some people's taste. It is an academic work and probably a trendsetter that cannot be ignored by historians reflecting on this part of history in future. Yet it might not be to the taste of someone who wants a light read. It comes highly recommended. I hope Audible will see their way open to publish more of Prof. Brown's books in audio format. I am about half the way through the audio book and completely absorbed by it. It's a detailed story of a complex swath of history, yet it hasn't gotten bogged down itemizing battles and rulers. Instead, it reveals the spirits of the times through the lives of history's notable intellects. Even better, it explores what historical writers didn't say, but that historians have since deduced, to shed light on the realities behind the dogma. The narrator's mispronunciations, however, are driving me nuts. His voice is excellent, his pacing and emphasis are good, and even some of his mispronunciations I could live with if he would simply stick with them. But instead, he ping-pongs back and forth, seemingly unable to decide. Is it AM-brose or Am-BROSE? Constan-TEEN or Constan-TINE? Will it be tree-AY or tree-AIR for Trier? Sometimes I find myself talking back to him: "Prelate rhymes with pellet, not relate!" "Per-VANE-us? Did you perhaps mean parvenus?" And I almost spit out my coffee when he tried to say "Plus ça change plus c'est la même chose". It was so funny I wish I'd bookmarked it. Nevertheless, I'd rather listen to this very dense book, mispronunciations and all, than try to find the time and focus to read all 800 pages myself. Where does Through the Eye of a Needle rank among all the audiobooks you’ve listened to so far? This is a book of outstanding scholarship written with great clarity by one of the most knowledgable and trustworthy historians of the period of the late Roman empire. Brown uses the issue of wealth as a key to enter a complex social and religious world that saw the emergence of Christianity into the ancient hierarchies of power, prestige, and vast wealth that had powered the Roman empire for many centuries. Brown's narrative is fascinating and relatively easy to follow and brings to life the variety of characters and interests of the period in a wonderfully vivid way. He leads the listener to understand the nuances of primary texts while evaluating many current debates among historians with a sure touch. Brown writes as a person who has lived in the world he describes for many years and understands its nooks and crannies like a native. I emerged from the long journey with a tremendous sense of gratitude for Brown's guidance through an important historical period in which modern prejudices could easily distort my perceptions. Cooper reads the book with great clarity and articulation. My only problem with the narration was that quite a number of the names of ancient people or texts or technical terms seemed mispronounced. It did not seem in keeping with the high scholarly quality of the book otherwise. I highly recommend this work. It is very substantive and assumes that the listener has a basic knowledge of the period covered. But it certainly rewards careful listening. Almost all my interests are here, told with a sprightly and inspired grace and virtuosity I have NEVER (in hundreds of books) heard before. Here is top-notch history of things previously unseen; lucid art history; theology told as I've never heard it; economics and finance; vividly etched characters (geniuses, poets, rogues aplenty, the great and poor), an implicit grand sort of game theory (how did the players at all levels make their moves as Rome tottered and changed beyond recognition in every way, physically and culturally? ), (on and on) .... This author is ever-scholarly yet can describe events, people and thoughts with such felicity, such vividness, I feel I am living through countless events, rich in nuances and levels, effortlessly from small details to grand sweeps of thought and event, transparently. Meaning, the immersion works so well, I forget I am listening to a book. Now I have some deep and nuanced comprehension of how Pagan Rome became Christian Rome, and how the material and spiritual interfaced in the minds of key actors along the way. The author will pause on a word, such as an earlier Latin version of today's "commerce" -- and show a former usage, as something that could flow in exchange between the people and things of earth and the divine. I am immensely enriched by this book. I think also, rarely, this can be interesting and enlightening without rancor to both the pure classical scholar, the pure aesthete, the economist, and the religious believer. Most books by believers I have to filter some as the authors wriggle and wrestle more or less gracefully to retro-fit the historic record to pre-set religious doctrines. This author encounters no such problem in giving us a tour of the thinking of these characters, grounded in various writings, artworks, legal records, and public works. We can feel the earthly exultations of a rich 4th-century Roman of an earlier world-view, watching it evolve into more ethereal (yet very vivdly lived) Christian orientations, and often bit by bit. These people are assailed by doubts, contradicted by friends, fought by ecclesiastical competitors: this is the full drama of messy history. There were blends and hybrids of old and new thinking all along that are fascinating (and not unfamiliar in new-agey spiritual fellowships I've seen here in contemporary California). Yes, there are few really new things under the sun. But I have been given a new and much deeper view of things right in front of me. Again and again, Brown considers traditional interpretations major events and personalities in this period, and then offers a new interpretation, sometimes his own, but more often a condensation of an emerging consensus among Late Roman scholars. He is very much a cheerleader for recent developments in the study of this period, often citing and complementing, the work of others. This book is not simply a narrative study, although it does generally progress chronologically. It is also an exploration of how historians work, and a lesson in interpreting sources. Brown is a confident but unpretentious guide through a territory about which I knew nothing aside from a few offhand generalizations. As I near the end, I not only feel that I have a vivid and insightful understanding of some of the major figures (Augustine, Jerome, Paulinus of Nola), but also a real sense of how people's ideas and feelings about wealth evolved, and how these developments interacted with the wider context of a disintegrating empire and an emerging new order. Brown studiously avoids both political history and discussion of doctrinal differences, both of which are fascinating, but available elsewhere. So you won't learn anything consequential about who the emperors were, or theological beliefs of the Manicheans or Arians or Donatists. It is a bit jarring at times to skip over what seems like essential information, but I have to grudgingly admit that Brown's precise, unwavering focus pays off. In the end, the vision of evolving attitudes towards wealth is unclouded by any distractions. Would you listen to Through the Eye of a Needle again? Why? The author is perhaps the greatest living historian of this period. His literary style is poetically vivid and his use of metaphor makes voices long since silenced by death seem momentarily to tremble with life. He shifts between the grand vistas in which an entire horizon is laid before one, and darts down to show the smallest of details. It is truly an astonishing achievement. Surely not. It's a lengthy audiobook but is so delicious that I could have wished it longer. The narrator has a lovely voice and I enjoyed listening to his reading. He often mangles pronunciation of words that are not English and it seems from other reviews that many find this grating. I noticed it but it found it a minor part of the experience of listening to the audiobook. This is one of those books that sheds an astonishing amount of light on the evolution of the western world, in politics, religion, and the distribution of power and of wealth. It's much less about how Christian doctrine changed the pagan world, than about how Christian doctrine evolved to co-opt pagan wealth and power structures, letting the church emerge as a temporal power in its own right. Along the way we get marvelous peeks at life in late antiquity which animate the whole narrative. I found this book fascinating, and perhaps recommended best for those with a taste for thorough historical documentation and methodical argument. Peter Brown is clearly a master of this period of Roman history, deeply familiar with the latest archeological and textual discoveries, allowing him to overturn many long held misconceptions. A gap in my historical knowledge, this book explores the interplay between Christianity and traditional Roman views on wealth and how this brought about modern thought and the Catholic church. I also gleaned insight into some parallels between the decline of Rome and the decline of the United States, but I don't think the author intended that. I can admit this book is in many ways over my head. The writer quotes copious amounts of Latin, at some points I'm unsure why it was necessary. While this is not my century or region of interest, I can say I learned a lot. I really enjoyed the approach of this history. It is a history of Rome from the fourth to the sixth century from the perspective of the economics of a changing world in a state of flux caused by the rise of Christianity. The importance of Northern Africa to the Roman world was brought out in a way that I have never understood before. The fact that history is made by the rich and powerful is made profoundly clear in this work. The poor and down-trodden leave no mark save for the manner in which the rich are moved to bring them aid. This is a fine book. Fleet Cooper gets kudos for his excellent diction. I could always understand what he was reading. Some of his odd pronunciation choices, however, rise to the level of annoyance after a time. He has obviously done some study of different languages and he pronounces foreign words with ease. The problem is that he lets this foreign language training influence the way he pronounces words that are to be spoken in a certain way in English. This is pervasively noticeable for names containing the letter “U.” He insists on giving it the long vowel sound even when the short vowel sound is correct. Towards the end the historical figure Pelagius enters the narrative and I had to suffer through many pronunciations of “Pell-ay-gee-OOS” before he began to say it correctly: “Pell-AY-gee-us.” These oddities of pronunciation were a distraction but did not detract from making this an excellent audio book. I like history but this is way too particular for me to enjoy and keep interest for such a long listen. Someone with a major in Church history for that period might appreciate though. What three words best describe Fleet Cooper’s performance? The narrator is excellent and probably the reason why I could hold on until mid point in the book. If you could play editor, what scene or scenes would you have cut from Through the Eye of a Needle? The potential subject matter was very good, but I lacked knowledge of places and names to enjoy it.